Pure Engelhard gem. In this one, The Girls of Cincinnati, he's given us something never thought possible, a coming-of-age saga that's also a sizzling thriller. The plot here is riveting. The dialogue sparkles. What's it about? It's about life. Anyone who's been in love - especially love that appears to be out of reach - will understand what's going on between Engelhard's two heroes, Eli Brilliant and Stephanie Eaton. Anyone who feels the approach of menace will understand what these two must endure when a crazed woman appears on the scene, threatening them both with "a fate worse than death." Anyone who works at a dead-end job will be right there with Eli, who ends up working for Harry's Carpet City in Cincinnati, Ohio. Eli is back home in the Midwest after he failed to make it in New York as an actor. So that's one dream down the drain. But now that he's back in Cincinnati, he's got Stephanie Eaton - or does he? Something always goes wrong between them, and this time, terribly wrong. Engelhard, the last of the Hemingways, gives us the heartland of America as it's rarely been given to us before in literature. He gives us an unvarnished view inside the world of Sales and he gives us a broken-down old salesman that's the equal of anything produced by Arthur Miller and David Mamet. Engelhard is most precious in his asides, his quick-cut commentaries. In Eli Brilliant, Engelhard gives us a character, though young and handsome, who we can all identify with - especially when we find Eli always reaching for the unattainable. Yes, he's a lover, a chick magnet - hence the title - but don't be fooled. This character, and this novel, goes much deeper. From start to finish, The Girls of Cincinnati is a triumph. 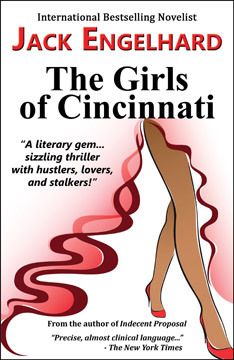 "Engelhard tells the story of The Girls of Cincinnati with precision through his masterful narration. Every word has a place and every page has a quote you will want to remember." "A literary gem! I could not put it down." Mention the title, author and/or ISBN 978-1-77143-139-2.